Want to get free peripherals simply by playing games on your PC? 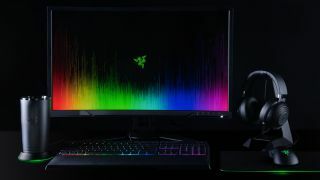 Of course you do – and to that end Razer has now made it possible to earn reward points, in the form of its new virtual currency, which it introduced a couple of weeks ago, by playing certain games while using the Razer Cortex software. Razer’s virtual currency lets folks exchange real money for zGold, with spending the latter giving you access to discounts and also earning you zSilver reward points – which can be redeemed for various freebies and further discounts. Now Razer has added a new method of picking up these zSilver points, by playing specific games with Razer Cortex – software designed to optimize performance for better frame-rates, and perform other tricks related to streaming or recording game sessions. Simply by playing Overwatch, League of Legends, Dota 2 or CounterStrike: Global Offensive with Cortex running, you’ll accrue six zSilver points per minute up to a maximum of 900 per day. As mentioned, those points can be used to obtain discounts, or entirely free bits of hardware – although you’ll need to earn a lot to get anything decent. For example, if you fancy a free Razer BlackWidow Chroma V2 it’ll set you back 220,000 zSilver – so at 900 per day, it’ll take you 245 days to bag that particular mechanical keyboard. That’s the most expensive peripheral going, mind you. You can get a Kraken 7.1 V2 headset for 130,000 zSilver, for example, or a $20 (around £16, AU$26) discount on a Razer headset, mouse or keyboard of your choice for 10,000 zSilver. A laptop stand for the Razer Blade Stealth gaming notebook will set you back 65,000 zSilver. Perhaps the best way to think of it is that if you’re playing these games a lot anyway, just fire up Cortex in the background and forget about it, and eventually you might find that you can get something tasty for free, or at least a solid discount on an accessory. Oh, it’s also worth mentioning that a new and exclusive item has been added to the company’s lineup which can only be bought with zSilver – a Razer mug holder. It’s a little more fancy than it sounds, having Chroma lighting on the base, and it blinks to let you know when you should take a sip (based on an optimal hydration schedule, no less). That little accessory will set you back 100,000 points. Did Razer make one of the best gaming laptops of 2017?